Public corruption has existed ever since the time of the Roman Empire, and likely long before. All that is required for the cancer of public corruption to gain a foothold in any society is: a) a society / sovereign country to form a government and to then establish a set of laws which the society shall adopt and follow ; b) a breach of the public trust and the laws by the government (public) officials elected, hired, or appointed to ensure such laws are followed ; c) the breach constitutes a condition whereby the public official (usually conspiring with private sector accomplices) solicits, demands, accepts, or agrees to receive ANYTHING OF VALUE in return for being influenced in the performance of their official public duties. For ease of discussion in this article, I shall simply use the most common description of corruption, “ Quid Pro Quo,” which means “something for something” when referring to such abuse of office / power. What I have described above, is public corruption in its simplest form. One public servant, or perhaps a small group of public officials who abuse their office for personal gain. Sadly, this public corruption is absolutely routine in every city, county, and state within the United States. Every person can easily identify such a situation in the area where they live. For example, in one local county, about 2 years ago, the person who worked for the local District Attorney in a finance / controller position was charged and prosecuted for the theft of over $100K over several years. The person was influenced and in cahoots with another public servant, for their mutual benefit. Public sector purchasing agents who accept expensive gifts in exchange for contract awards are frequent offenders.Such behavior is commonplace. 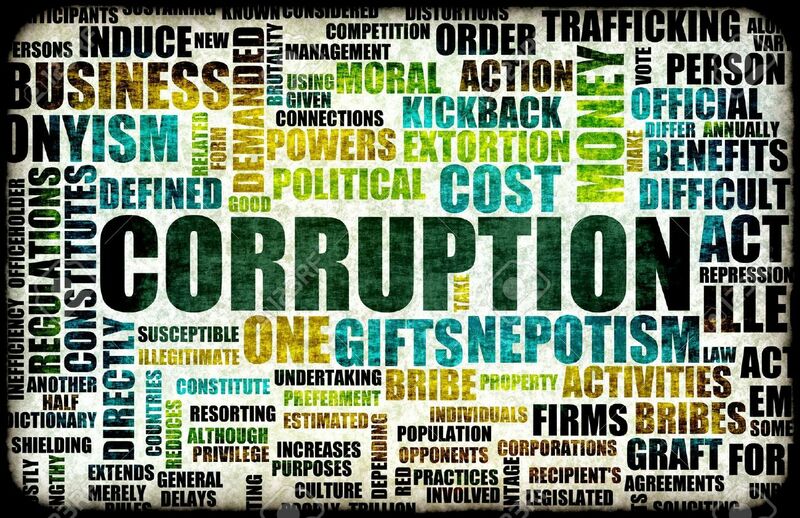 However, when the public corruption in a society reaches into the highest levels of government and when it becomes so widely engrained and pervasive that it is accepted as “routine and normal,” then that society has entered an entirely new galaxy of corruption. When the corruption reaches a National level of lawlessness for the regime in power, and there is no law enforcement capability against that corrupt regime, when there are no consequences for law breaking, as long as you are a member of the vast corrupt regime in control, then that is a society that has suffered a coup. The citizens of that society have lost the government and the protection of the laws that they were taught were in place to protect all citizens. These citizens have suffered indoctrination. These citizens are now existing in a new, dangerous society where laws are only applied against those who oppose the regime in power. So, the regime in power is constrained by no laws, and the citizens who are not members of the regime are subject to any interpretation of any law that the regime wishes to impose. They are on the road to serfdom and slavery. This is tyranny. Does any of this sound familiar? It should! Welcome to the United States of America in the 21st century. In light of the recent 2016 presidential election, events involving the Obama/Soros and Clinton regime ( including the complete acceptance of thousands of anarchists calling for the assassination of President elect Donald Trump … with NO CONSEQUENCES from team Obama ) perhaps we all desperately need a one paragraph reminder of what our Founding Fathers granted to us …A Constitutional Republic, with 3 equal branches of government —— wait, make that 4 branches, because the Grand Jury, including the right of citizens to convene their own grand jury, was clearly stipulated in founding documents ( but I digress). There are several important words, concepts, and phrases that are written into or derived from the founding documents of this country, including the Declaration of Independence, the Bill of Rights, and the Constitution of the United States of America. I have zero intention in writing this opinion article as if it were intended to be thoroughly instructive in US history, but rather point out a few areas of our founding documents, so the reader can judge for themselves “ how far have we strayed from the laws and principles under which this country was founded”. I will cite just a few: all men are created equal ; equal justice under the law ; Bill of Rights, amendment one which guarantees freedom of speech, freedom to practice religion, freedom of the press, the right of the people to peaceably assemble and to petition the government for the redress of grievances ; amendment two which guarantees that the right of the people ( the individual citizen) to keep and bear arms shall not be infringed ; the guarantee of certain inalienable rights including life, liberty, and the pursuit of happiness ; a government of the people, by the people, for the people. All of these ideas have been obsoleted since Sept. 11, 2001, except for one. The Right to Bear arms is the primary right preventing this entire corrupt government from completely enslaving the people of this country. And one Hillary Clinton was 100% determined to take away the people’s guns ( thank you Wiki Leaks ). The government of the United States has suffered a soft coup due to massive public corruption, and only about 20% of the citizens ever knew or cared…… until Donald Trump woke up the sleeping masses. Maybe if the all of us had been more informed and paid heed to some words of wisdom from one of the most brilliant Supreme Court Justices of the last century, Judge Louis Brandeis, then possibly we would not have been so easily conquered by the Bush/Clinton / Obama regimes. But, alas, to pay attention to such political matters such as the destiny of the country is not in the nature of most human beings. Sadly, most are simply either very busy citizens, or else useful idiots. You can self diagnose which group you belong in. Had we bothered to even try to recall and understand any of the wisdom of Justice Brandeis, then maybe we would not be in such dire straits as a country. What follows is just a small sample of the wisdom we may have gained. Next articleAre Liberals Hi-Jacking Higher Learning?